Getting an icy cold blast when you’re expecting a nice warm shower first thing in the morning is never a good way the start the day. A water heater that isn’t working properly requires immediate attention, and at GT Campbell Plumbing, we are proud to offer a full range of services for water heaters in Rochester NY and the surrounding areas. The most obvious sign that you need to repair your water heater is, of course, failure for your water to get hot. There are several other things to watch out for. If your heater doesn’t seem to be heating water like it used to or if your water has an unusual smell, color or taste, it could indicate a problem with your water heater. Though today’s water heaters are built to last, nothing is designed to last forever. The average tradition tank-style water heater is designed to last for 8 to 10 years, while a tankless water heater can last up to 20 years. In time, water heaters begin to lose their efficiency and become more prone to breaking down. If your water heater in Rochester is nearing the end of its lifespan, you may want to consider replacing it and installing a new one before you face a major problem. Whether you need a water heater for a new construction project, your water heater has failed and you’re in need of a new one, or you’re just thinking about upgrading to a newer model, there are several types of water heaters from which to choose. 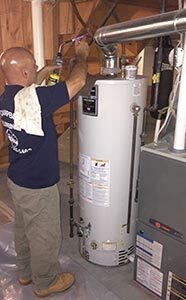 At GT Campbell Plumbing, we are proud to offer comprehensive hot water heater services in Rochester NY and the surrounding areas. To schedule an appointment with a trusted Rochester plumber, please call now.